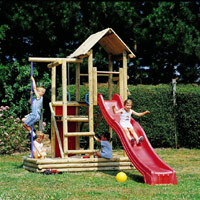 Wooden Climbing Frames - A Great Way For Your Children To Enjoy The Garden! Here at MadFun we have carefully selected what we consider to be the best range of Wooden Climbing Frames available in the UK today. 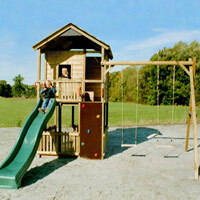 Not only do we have two exciting climbing frame ranges but we can also offer a build service in the south east. We have been retailing these climbing frames in the UK since day one and have built up an in depth knowledge of them. You can make use of our years of experience in selling, designing and building these play centres, by contacting us on 0800 6529992 with any specific requirements. 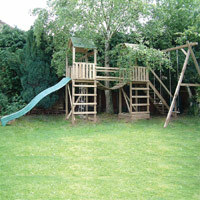 Also by ordering through us we can save you money on the best quality wooden climbing frames available in the UK today. We differ from the majority of websites because we can help you design your own childrens activity centre from our range as we have had years of experience selling and building them. Please click here for more details and to see how a Gate Lodge goes up. Phone us now on 0800 6529992 for some "hands on", experienced advice. 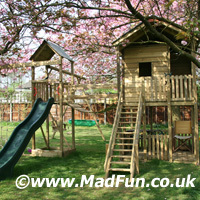 MadFun offer Wooden Climbing Frames from the manufacturers Action Tramps and Hout-land. Our entry-level PlayCentre offers all the features needed for a wide range of outdoor play activities. Attached to the strong wooden tower is a tall swing-arm with two wooden swings, heavy-duty 3m slide and full-sized commando net. Built into the base of the tower is a sandpit with two wooden seats. We use pressure-treated planed rectangular timber to minimise splits and cracks. Detailed assembly instructions and all necessary fittings are provided to make construction a straight-forward DIY job. Please note that the dimensions supplied correspond to the layout in the photos, and will change if you chose to assemble the unit in a different configuration. This unit can also be specified without the swing-arm if space is at a premium. Extra play value can be provided with the addition of either the Assault Course on the end of the swing-arm, or the attachment of our Monkey Bars accessory. Designed for lots of fun and adventure at a reasonable price. 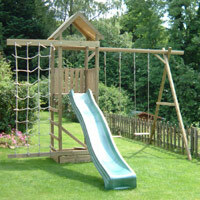 This 'next generation' outdoor play equipment consists of two wooden towers connected by a suspended clatterbridge, reached by a sturdy wooden staircase. The tall swing-arm provides two wooden swings, and off the towers are fitted a heavy-duty 3m slide and full-sized commando net, great for climbing. Built into the base of one tower is a sandpit with two wooden seats. We use pressure-treated planed rectangular timber to minimise splits and cracks. Detailed assembly instructions and all necessary fittings are provided to make construction a straight-forward DIY job. Please note that the dimensions supplied correspond to the layout in the photos, and will change if you choose to assemble the unit in a different configuration. The largest of our Playcentres, the Gate Lodge has no equal in terms of quality, features or price. This unit was designed to provide a get-away space for teenagers, a club-house for 12 year olds and a play-house for little ones, as well as a Playcentre with slide, swings and climbing face. The Gate Lodge measures 1.8m x 1.8m (6ft x 6ft) with an interior cabin size of 1.8m x 1.2m (6ft x 4ft). At ground level is a fenced wooden floor fitted out with a wooden table 70cm (28") long x 40cm (16") wide and two wooden bench seats 90cm (35") long x 25cm (10") wide. Even with the table and chairs present there is a substantial amount of space available for toy storage or a small sandpit. Outside a 60cm (24") wide wooden ladder leads to the balcony, 1.5m (5ft) off the ground. Wooden railings control access off the balcony. At one end of the balcony is fitted a 3m (10ft) wavy green slide, the other end provides access to the rock climbing wall. The swing-arm is supplied with two adjustable swings with wooden seats and is able to accommodate the Assault Course accessory on the end of the beam, as well as a single climbing rope. Further accessories for the Gate Lodge include a Clatterbridge 1.6m (63") x 0.73m (29"), a full-sized Commando net (as fitted to the York & Arundel) and its own Monkey Bars Accessory for climbing and swinging activities. The MadFun Mega Play centre has no equal in terms of quality, features or price. This twin tower unit was designed to provide a get-away space for teenagers, a club-house for 12 year olds and a play-house for little ones, as well as a playcentre with slide, swings, commando net, climbing wall adjoined by a clatter bridge. The Lodge measures 1.8m x 1.8m (6ft x 6ft) with an interior cabin size of 1.8m x 1.2m (6ft x 4ft). At ground level is a fenced wooden floor fitted out with a wooden table 70cm (28") long x 40cm (16") wide and two wooden bench seats 90cm (35") long x 25cm (10") wide. Even with the table and chairs present there is a substantial amount of space available for toy storage or a small sandpit. Outside a 60cm (24") wide wooden ladder leads to the balcony, 1.5m (5ft) off the ground. Wooden railings control access off the balcony. At one end of the balcony is fitted rock climbing wall and the other leads via a clatter bridge to a standard Arundel play centre. The swing-arm is supplied with two adjustable swings with wooden seats. The best of the Hout-land round timber playtowers. The 2 floors can be reached by a small ladder, a climbing wall, a vertical ladder, a climbing rope and a firemans pole. 4 ground anchors are supplied with this outdoor play equipment.